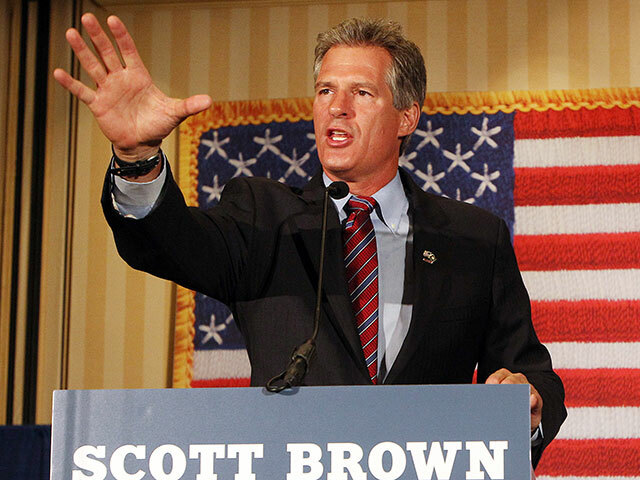 MANCHESTER, New Hampshire — Former Sen. Scott Brown, who’s running against incumbent Democratic Sen. Jeanne Shaheen (D-NH) to be New Hampshire’s next U.S. Senator, will deliver a foreign policy speech here midday Wednesday during which he’ll hammer Shaheen and President Barack Obama for weakening America’s standing in the world. Excerpts of the speech obtained by Breitbart News ahead of its delivery show that Brown, a former U.S. Senator from Massachusetts who moved to New Hamsphire after losing re-election to Sen. Elizabeth Warren (D-MA), plans to argue that Shaheen and Obama have together weakened America on the world stage. Brown will note that Shaheen is “a member of the Foreign Relations Committee” and “has been in that privileged position for nearly six years” but her record shows she’s voted with the president nearly 100 percent of the time. Brown will hammer Shaheen many times more throughout the speech as well, but will also lay out how he plans to be different as a U.S. Senator from New Hampshire–citing his record as a U.S. Senator from Massachusetts.